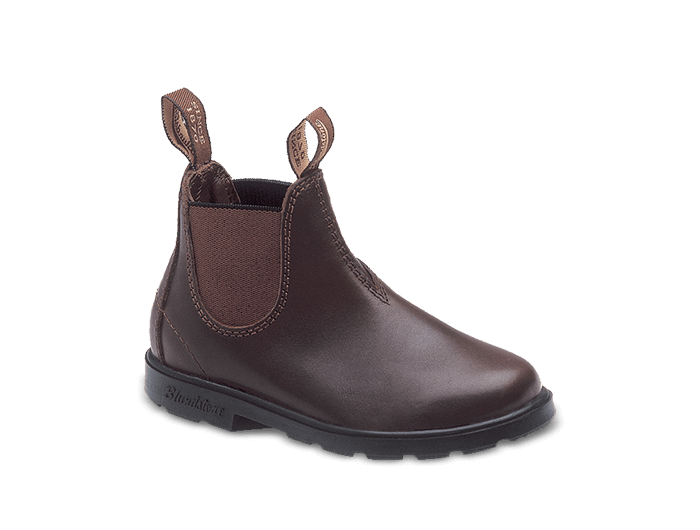 Blundstone 530 Kids Boots. Be just like Dad. Little Blunnies for the kiddies, so damn adorable but so practical too. Gives the kids their independence because they slip on and off, leather means no stinky feet, the best support on the market, and the removable insole means you can tighten the fit to start with, and then get a few extra months of wear when they start to get a bit tight. These ones are the classic Brown Chestnut leather, so they're durable enough for the sandpit, and polished enough for visiting Nana. Full leather lining for your added comfort. Soft cushioned polyurethane (PU) sole with original pattern. Full-length cushion footbed plus extra removable washable footbed with fitting guide. Waterproof elastic comes in handy when encountering puddles of all kinds.